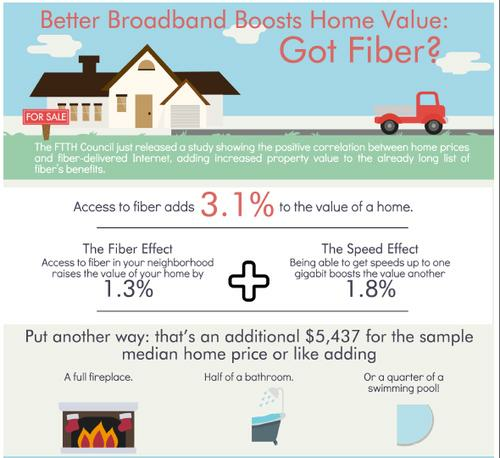 U.S. homes with fiber broadband service can be worth 3 percent more than homes without service, according to the Fiber to the Home Council Americas in this June 29, 2015 graphic. High-speed fiber broadband service, with 1 Gbps download speeds, can add more than US$5,400 to the value of an average U.S. home, according to a study commissioned by the Fiber to the Home Council Americas (FTTH), an advocacy group made up of fiber equipment vendors and broadband providers. That $5,400 figure is approximately equal to adding a new fireplace, half of a new bathroom or a quarter of a swimming pool, according to the study, conducted by researchers at the University of Colorado at Boulder and Carnegie Mellon University. Speed matters, the study found. For homes where 1 Gbps broadband was available, sale prices were 7 percent higher than for homes in areas with broadband speeds of 25 Mbps or lower. The study, possibly the first to look at the link between home values and fiber service, could help drive a new "fiber boom," like late in the late 2000's, said Kevin Morgan, FTTH's board chairman and director of marketing communications at Adtran, a telecom equipment maker. Several broadband providers have announced new deployments in recent months, and the study can help local governments push providers for new fiber deployments, added Heather Gold, FTTH's president and CEO. FTTH helps local officials work with providers on deploying new or faster broadband service, Gold said. "If a community wants to get fiber to the home and they understand the economic value ... both to homeowners and the community in total, that helps them decide, 'Hey, we're going to help this broadband provider make an attractive investment case,'" she said. In 2014, FTTH released a study finding higher per capita gross domestic product in communities where gigabit Internet was available. The study used home sales data from 2011 to 2013, U.S. Census Data and the U.S. Federal Communications Commission's 2012 and 2013 national broadband maps to investigate the relationship between broadband availability and home prices. The study looked at about a half million home sales during that time frame.